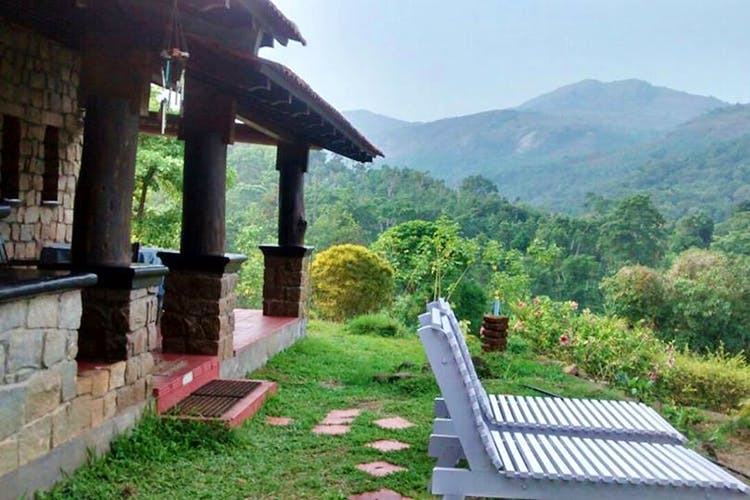 A two-cottage homestay in Coorg which has five rooms for about 16 guests, this one is simple and fuss-free. But what makes it a winner is that it’s far from civilisation and is right on the edge of a river. You’ll see why its name River Edge Valley is most apt! River Edge Valley is located in Mukkodlu, a lush area, with nothing but coffee plantations as far as the eye can see. And it’s just about 20 minutes from Madikeri. Set on a hill, what I really like about this homestay is that it is rather cut off from town, and even mobile network is minimal here — except if you’re on BSNL! There are two cottages, cosy and made of stone. The one we stayed in had three bedrooms, but one of them was inside the other — so all you couples travelling with friends, be warned! It’s fantastic for a big group though, because the party doesn’t need to split up after merriments of the evening. My favourite part of this homestay, apart from food, is the location. Right by the river’s edge, in a valley and amidst coffee plantations, it’s like a slice of paradise. The river wasn’t very full when we went, so we spent a good many hours sitting on rocks in the middle of it, feet in water, just chilling and catching up. Trekking is also a fantastic option — they’ll organise easy walks, proper treks and even hikes, depending on what you’d like to do. I recommend you even walk to Kote Abbey Falls — the mini version of the roaring Abbey Falls, which itself isn’t too far away. Not into the great outdoors? Grab a book, a cup of steaming coffee and head to the attic area of the cottage that’s a chill out zone — easy chairs, hammocks and bean bags, with a perfect view of the undulating hills. The hosts are lovely. They take great care to make sure your stay is comfortable. And that includes lavish albeit homely meals that include rice, roti, dal, two vegetables and even two options for non-vegetarians. My demanding crew even wanted fish (yes, in Coorg)} so they brought in fresh river fish for dinner! The bathrooms are very large, but the rooms are small. And don't expect luxury. It's very homely.